The Pound edged back above the 1.29 mark against the US Dollar this morning, buoyed by some strong UK labour data and optimism over a softer exit from the European Union. heresa May stuck to her guns on Monday, with her ‘plan B’ for Brexit promising much of the same, namely returning to the European Union to renegotiate over the Irish border ‘backstop’. The Prime Minister vowed to seek changes from the EU regarding the backstop in the coming days, with the hope that a modified version of her deal could pass in a second parliamentary vote next Tuesday, 29th January. The scale of the opposition to her deal does mean that this vote is again unlikely to pass, in our view, with May giving very few details as to how the deal would be changed. She again failed to rule out a ‘no deal’ Brexit and stated that Article 50 would not be extended at this time. Sterling, however, reacted relatively positively to her comments, buoyed by her promise to be more open with parliament on the negotiations, opening up the possibility of a slightly softer Brexit. Away from politics, this morning’s UK employment figures continued to show that Britain’s labour market was performing remarkably well, despite the growing uncertainty over Brexit. The rate of unemployment fell again in the three months to November to 4.0%, its joint lowest level in 40 years. 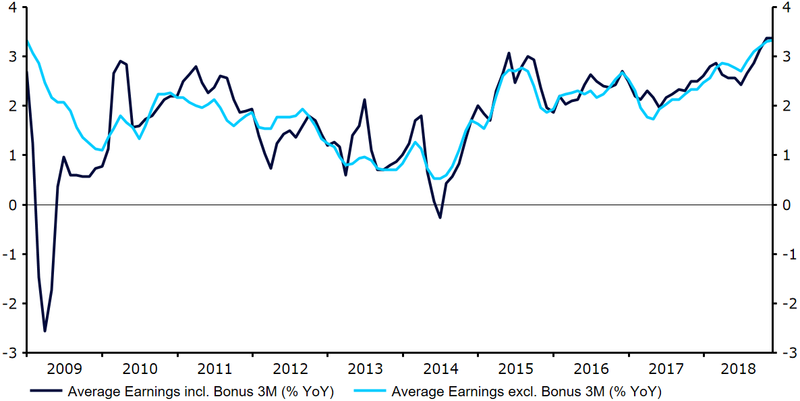 Crucially, earnings growth also ticked up again, with wage growth including bonus’ rising to 3.4% from 3.3% (Figure 1). This marked the measures highest level in over a decade, supporting our call for another Bank of England interest rate hike in H2 2019, providing we see an orderly Brexit in the meantime. With the US government shutdown limiting the number of major economic data releases across the pond, the EUR/USD pair spent much of trading yesterday stuck in a very narrow range. The safe-haven Dollar and Japanese Yen were somewhat supported by the release of the latest set of growth forecasts from the IMF, which suggested that the global economy was likely to grow at a slower pace in 2019 and 2020. The governing body lowered its overall growth projection for the global economy to 3.5% from 3.7%, citing weaknesses in Germany and Turkey. Investors will now turn their attention to Thursday’s European Central Bank meeting. Following the string of underwhelming macroeconomic releases out of the Eurozone, we think that President Draghi will strike a cautious tone. We expect Draghi to highlight growing downside risks, while revising lower the bank’s economic growth projections.